Comments: Here, or a few yards beyond, is your position after a good to above average tee shot. 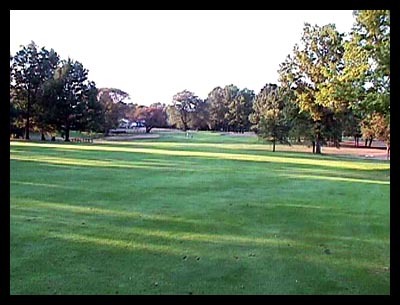 A skilled player will pull a fairway wood or long iron and put something up around the green. For everyone else this shot presents an interesting and crucial decision to make. Depending on wind, there's only a PW to an eight iron to lay-up in prime position in front of the creek (not visible from here) where the 3rd shot into the green leaves about 140. The temptation to use a fairway wood from here is irresistible. Many players carding double and triple bogies will look back to this spot in the fairway as the place where all their trouble began.